Don’t leave home without our newest rally signs! Pack of nine, with three signs of each striking design. 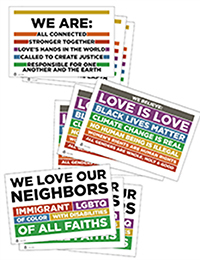 Not intended for use as yard signs as they are not waterproof. A must-have for your next march, rally, or witness event! Don’t leave home without our newest rally signs. Each package contains three signs of each striking design for a total of nine signs. Signs measure 18 x 12” and are printed on both sides of heavy (10 pt.) cover stock. Not intended for use as yard signs as they are not waterproof. Looking for yard signs? You can order them directly from our recommended printer! Ordering instructions are available here.